So you get your hands on a Sony FS700 and fancy putting it through its high speed paces. Do you: a) Head to the nearest skate park for some speed-ramped kickflips? b) Stage an all out water fight where you can feature each droplet of water as it makes contact? or c) Throw flour, punches, deserts and other random objects at people? For Maltese director Frank Briffa the answer was none of the above. Instead he decided to head off to a slaughterhouse and pick up some choice cuts for his title sequence turned experimental short Followroadfindlight. We asked Briffa to share all the gory highlights behind the production. 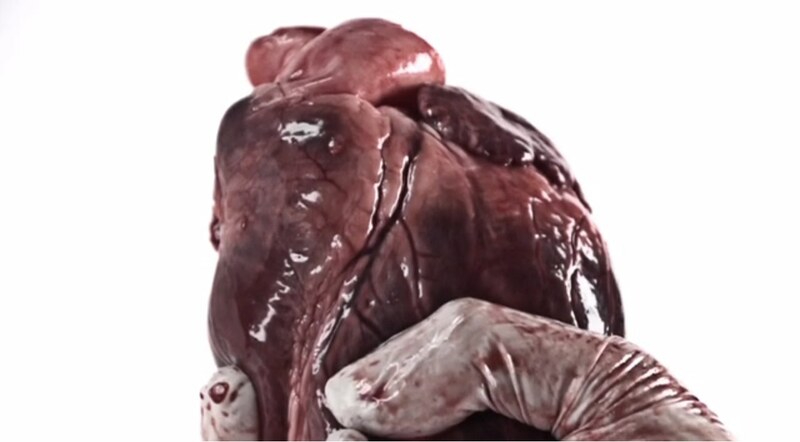 WARNING: This is a film comprised of animal organs & blood so if that description makes you queasy you probably shouldn’t hit play. A few months back a friend of mine called to tell me that he had access to a Sony FS700 and wanted to shoot something using its high speed capabilities. Not wanting to do the usual extreme sports or water splashing scenes we went to the slaughter house and picked up a pig’s head and some organs. Together with my girlfriend at the time we went to the studio, set up a simple white background with even lighting and shot lots of gory scenes of blood splattering, scalpels tearing flesh, organs falling, injections extracting blood, etc…. The idea was to edit them together and create a sort of opening credits sequence to a horror film. We were thinking fast cuts to industrial music. Something commercial, effects driven, and ‘cool’. We went to the slaughter house and picked up a pig’s head and some organs. Things didn’t work out with Fiona, my girlfriend, and we parted ways. The footage had not been edited yet and by the time I sat down to start editing many things had changed. Looking through the footage I was overcome by a feeling of loss and this drove the edit in a completely different direction to what was initially intended. Fast cuts became long unsettling shots, all the scalpel shots and all the organ shots except for the heart were discarded and the feel changed. Looking for music, I knew I wanted something slow, dark and intense. I used Soundcloud to track down some drone music and eventually found an artist called At the End of the Day. His music fit perfectly so I contacted him, asked his permission and he was pleased to have me use the music. It is interesting to see how we each handled the same footage and created two distinct works….